Fluffy the cat is living up to its name again, after a spell where Snowball might have seemed more appropriate. 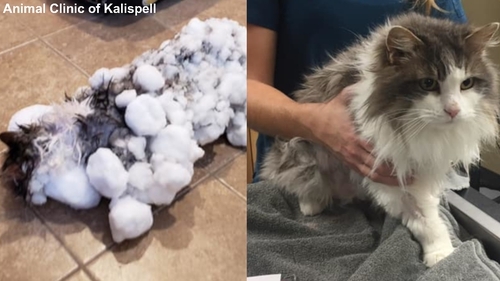 Vets in the US state of Montana managed to revive a cat found frozen in a snowbank. The Animal Clinic of Kalispell said Fluffy was brought in "essentially frozen and unresponsive". The cat arrived at the clinic on 31 January, and a photo from that day shows Fluffy almost encased in ice. Vets started trying to thaw the pet with towels, cage warmers and intravenous fluids. A few hours later Fluffy finally began to show signs of recovery. On Tuesday, vets shared the good news that Fluffy had made a complete recovery – though one of its nine lives may be gone!